Continuing our look at what the future could be for Non League Football, we have been lucky enough to secure the thoughts of Hugo Langston, not only one of the nicest people in the world but a man who lives, breathes and kicks the Non League game every day. Last season Hugo could be found on the touch line at Horsham and Chipsted as well as running his own academy. This season he will be working in the sunshine at Herne Bay in their first season in the Ryman League. When I was asked to write this article about improving non league from a manager/coaches point of view, my initial thoughts were like those of Victor Meldrew. Then I reminded myself how great non league football is, and that I am privileged to work in it. My initial thoughts were about referees, bad committee/chairmen, poor training facilities, boardroom politics, the blazer brigades who run leagues and money. However, this is all stuff that fans and spectators don’t care about. They want to see their club win and play well. No different to supporters of league clubs. Non league football to those who know nothing about it – your average SKY TV, premiership and football league fans – has a bad perception. I get comments from friends of mine like “Non league is crap” and “it’s just kick and rush”. Yet none of these guys have been to watch a game. They think it’s beneath them. Yes there are teams and managers who do play a more direct and percentage game, and yes there is a time to be more direct or hit row Z (especially if you are winning a game and are under intense pressure from the opposition), but most managers, coaches and players want to play football, passing football. In the last 9 months I’ve seen some great football, great players and great goals in my time at both Horsham FC and Chipstead FC. I’ve seen goals scored from clever corner routines, worldy 35 yard strikes and everywhere I’ve been I’ve seen passion from players, managers and fans. There’s never a shortage of drama too! It’s not expensive to watch non league football, you’re close to the action and you can mix with the players post match. You can’t do that in the Premiership. As a supporter you can be a proper part of the club. Clubs do a lot to get people through the turnstiles – non league day and kids for a quid are just two examples. I’d like to see more non league clubs forge relationships with pro clubs, and allow their season ticket holders free or discounted entry into a game. They’ll still spend money once they’re inside. I’d also like to see better behaviour from dug outs. I accept swearing and banter are a huge part of the game (I’m human and I swear too), but I think it’s unnecessary from managers during games. I was wrongly sent to the stands in a game in January for apparently swearing at the ref, and I won my appeal. That’s how strongly I felt about it. Believe it or not referees and their assistants have sworn at me during games this season too for asking innocent questions about decisions they have made. No need! 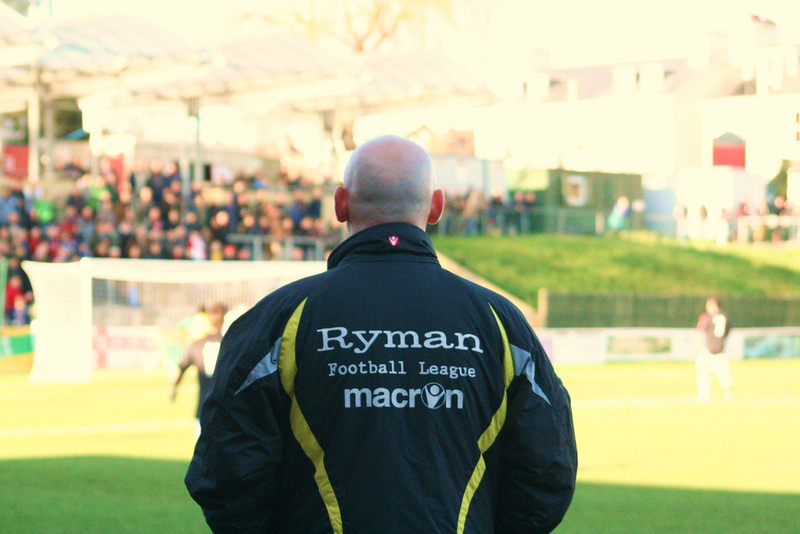 Non league football is also very cut throat, and I’d be in favour of some protection for managers/coaches. The League Managers Association exists in the pro football to help its members and I’d like to see something similar launched in non league. An organisation similar to the LMA where we coaches and managers can seek advice, have insurance and also attend functions where issues, best practice and suggestions can be discussed in an open forum. The majority of us managers and coaches in non league are not well paid (if at all) and I think this sort of organisation would be hugely beneficial to improve us as managers/coaches but to also improve the game as a whole. Non league clubs rely on a steady income throughout the season. This income comes from the turnstiles, club shops and club houses. In many recent seasons, there have been long periods of time when clubs have no games, due to unplayable pitches as it’s snowed, it’s freezing or it’s just too wet. Postponed games affect clubs financially, and rearranged games will be played midweek. Surely now then it’s time to address this and embrace artificial 4G pitches. Less games would be called off, you can train on it and modern artificial pitches are so like the real thing anyway. Maidstone United are moving to their new long awaited stadium and they have installed an artificial pitch. My old club Horsham are planning a new stadium and I advised them too to put in an artificial pitch. I think some clubs are put off as currently the FA won’t allow FA Cup games to be played on them (Maidstone will have to play any home FA Cup games at Chatham Town). Surely this rule can be changed? We need to move with the times. As you can probably tell I could go on all day, but I have saved something very important until last that I would like to see introduced into the non league game. We all witnessed Fabrice Muamba collapsing during a game playing for Bolton, and I feel there’s more we can do to check the health of our players. I believe players should be subject to full medicals at least once a year, regulated perhaps by the county FA’s. I realise there is a cost involved that not all clubs could meet, but there is money and funds available from various bodies, such as the Football Foundation and the FA itself. There have been instances of players collapsing and dying during non league games too in recent years. It’s something I certainly never ever want to experience. I’m not convinced that clubs are fully prepared should a player collapse in terms of the equipment available. There’s plenty of talk about it but very little action. I’ll now finish on this thought…. If you have never been to a non league game of football, I challenge you to go to a game next season. I promise you won’t be disappointed. Wherever you go you will be made welcome and I guarantee you’ll enjoy the passion, the drama and the honesty. You can follow Hugo on Twitter here.